Adware has been a plague on the Windows world for years. Unfortunately, this plague has begun to spread to the Mac as well. There are a number of different programs out there that serve no useful purpose except to shove ads in your face, all just to make money for the developer of the adware. Because it lives in the borderline between malware and legit software, though, detection by anti-virus software can be very hit-or-miss. This can make removal difficult. The most typical symptom of such adware is the display of advertisements on your Mac where none should exist. Adware also will often change your browser’s home page and search engine settings, and may even cause redirects from legit sites to sites constructed for the financial benefit of the adware developer. It can also cause secondary problems, such as web pages displaying incorrectly (due to insertion of foreign HTML code) or browser crashes. However, problems with unwanted ads in the web browser are not necessarily caused by adware on your computer. They could also be caused by a compromised network or a problem with the site itself. Before you do anything to remove adware, you should back up your computer. There is some risk any time you try removing software like adware, and the risk is larger if you choose to try removing the adware manually if directions aren’t followed precisely. If you don’t already have your computer backed up, go buy yourself an external hard drive around 2 (or more) times larger than the used disk space on your computer’s hard drive, and use Time Machine to back up your computer to that hard drive. MBAM for Mac will scan your system and help you remove any known adware automatically. Be sure to pay attention to any prompts, as you may need to decide whether or not to delete certain preference files, or may need to restart the computer and then do another scan. Read the prompts carefully, and be sure you understand and follow all instructions. 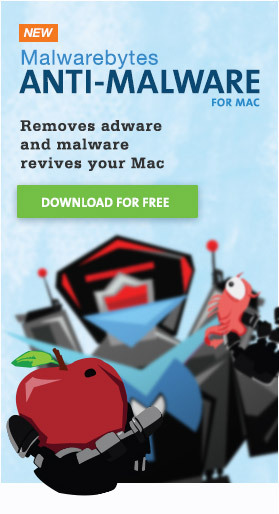 If you are willing and able to run Malwarebytes Anti-Malware for Mac, there is no reason to try manual removal. However, if you simply prefer to do things manually, or if you’re using a version of Mac OS X that MBAM for Mac doesn’t support, then you can try the manual removal instructions instead. If you opt for manual removal, be sure to follow the directions very carefully! Be aware that, for some adware, there is some risk involved with manual removal if you accidentally delete the wrong thing or don’t follow the instructions carefully. Some adware can cause your system to crash and be unable to start back up if the instructions aren’t followed carefully! If you don’t find any signs of adware, your problems may not actually be caused by adware at all. You may be on a compromised network, or an ad-supported wifi network. You may also be looking at a site that has been hacked, or even just an ordinary bad site. If you have followed the instructions in the first two steps carefully, but you found no adware in step 1 and the tests in step 2 indicate that the problem is due to adware, you can contact Malwarebytes support by opening Malwarebytes Anti-Malware for Mac and choosing Contact Support from the Help menu. You’ll be asked to fill in your name and a description of the problem (please be as complete and clear as possible! ), and then you can send the report, which will include some basic information about your system, to Malwarebytes via e-mail.